Buy Uphill Skiing and Light Tours of Colorado here and save money versus purchasing from within our app via Apple or Google. It’s exactly the same guidebook, but offered at a lower price on rakkup.com. In January of 2017, it began snowing in the Elk Mountain. A month later, it felt like it had never stopped. A long sequence of storm cycles had deposited over 10 feet of snow at Irwin, just outside of Crested Butte. Skier Gail Sovick heads-up the front side of Snodgrass mid storm. For backcountry skiers, a massive amount of snow in a short amount of time awakes a mixed bag of emotions. 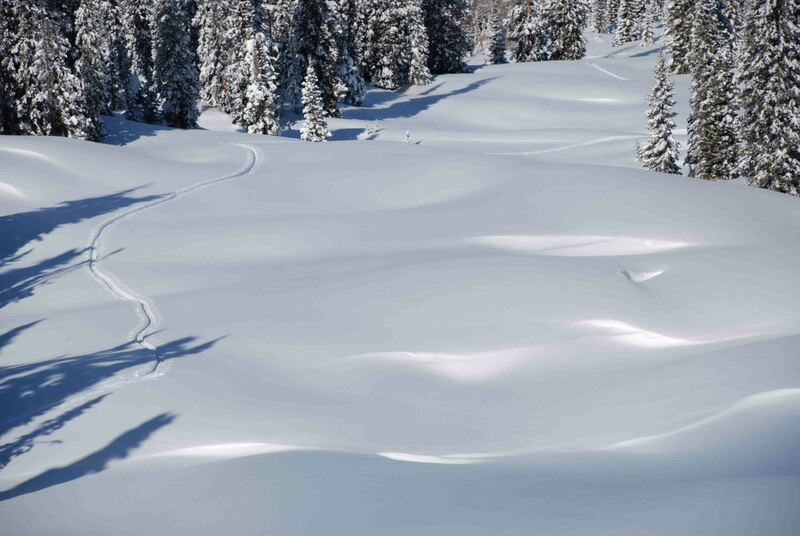 On the one hand, a skier cannot help but get excited about deep, deep pow. Images start appearing in our heads (and on our social media) of skiers porpoising way down into the white room, gloves and poles barely exposed above the surface as if they are the only way to catch a breath of air on behalf of the submerged powderhound. On the other hand, a lot of snow in a short amount of time means that avalanche danger is likely to rise, thus keeping us from venturing out into the steep-and-deep to realize our dreams of flying through the subnivean zone. During this storm, I stopped into Wild Snow Headquarters to talk about a new book that my publishing company had just released for backcountry skiing Snoqualmie Pass in Washington. 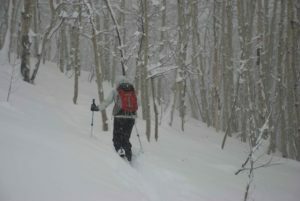 Lou Dawson runs wildsnow.com, which is one of the best online stops for quality and comprehensive backcountry ski news. Being the warm welcoming guy that he is, he invited me in for a cup of coffee, where we proceeded to talk about the storm that was surrounding our beloved mountains. We began talking about what we typically do during storms like this. Many people will read the avalanche forecast during storms like this, see that the danger is very elevated, and they will simply go to the ski area or just stay home. But backcountry skiers like Lou see things a little different. They begin to look for slopes in their area that are too low-angle to slide, but still steep enough to get some slow, yet oh-so enjoyable, turns on the way down. Lou and I began talking about these tours and how wonderful they are, not only for high-danger days, but also for days with novice friends, or quick before-work tours, or days when you’re nursing a pulled muscle. In our conversation, we soon came to realize that we don’t even need an excuse to go hit the “light tours” of our area…we just plain like them. Our conclusion was that it’s really good to have a list of your local light tours in the back of your mind when the context presents itself. 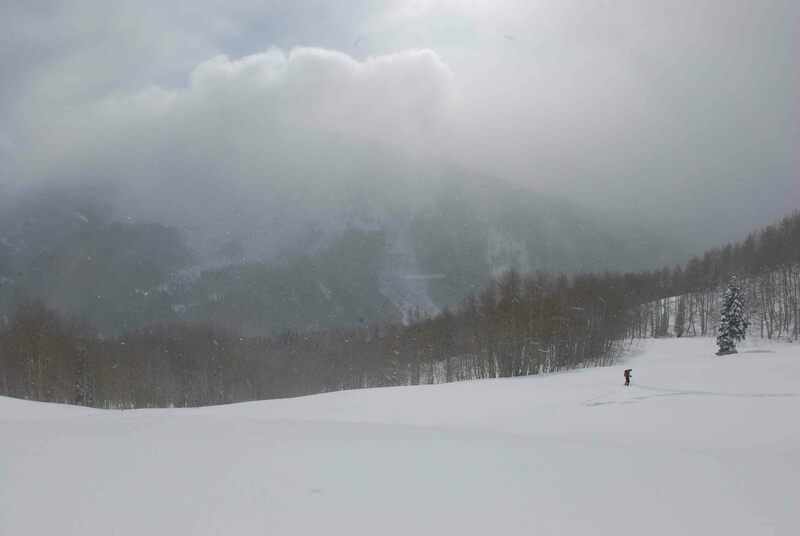 Skier Gail Sovick takes a meadow break in Crested Butte’s Red Lady Glades. So was born, the idea of creating a book that showcases some of our state’s light tours. It is said Colorado has 300 sunny days a year. Combine that with several thousand mountains, and a winter climate that’s downright temperate. The result: one of the best places on the planet for ski touring. Of course nothing is perfect. Colorado challenges backcountry skiers with limited public access options, due in part to it being a mostly rural, relatively un-roaded western state. More importantly, due to various climatic factors the state’s mountains can be prone to dangerous avalanches for much of every winter. Yet options exist. Key with backcountry travel is picking routes with lower angle pitches and other avalanche-mitigating factors. While these “light tours” are surprisingly difficult to find, they do exist. We detail a selection of Colorado’s best under these covers. 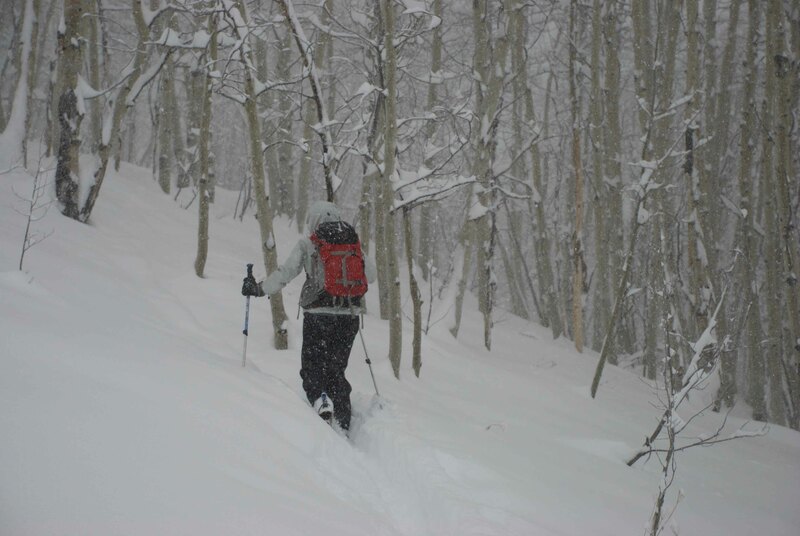 Further, a growing trend in ski touring is the use of ski resorts for “uphilling,” motivated by the need for a less committing experience — yet nonetheless an experience that can equal any other outdoor sport in enjoyment. Colorado lends itself to this as well, with most of the state’s more than twenty ski resorts allowing uphill skiing. Thus, we offer a special mix here, combining a variety of “easy” backcountry routes with recommended resort options. Pick one of our many days of Colorado sunshine, get out and enjoy. Learn more about Lou Dawson here.